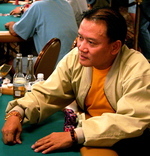 Men "The Master" Nguyen made a late season charge to overtake John Phan for the Card Player/Bodog Player of the Year award. Phan led almost all of the year, but Men started raking in final table appearances the past few months, including two first place finishes in back-to-back days at the Trump Classic ($300 buy-in NLH) to move into the lead. For the year, Men cashed an insane 51 times and made 16 final tables, banking over $1.5 mil in tournament earnings. *Photo courtesy of Wicked Chops Poker.